Some good stuff. All the Joshi wrestlers above have profiles on Joshi City, you can click on their name to go straight to it. We start the show with a match that has a wrestler I’ve never seen before. 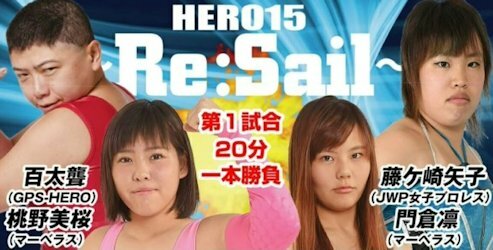 I couldn’t find a lot of information about Momotaro, except that she has wrestled infrequently since 2010, mostly with HERO. Mio Momono is a bit better known as she is a young wrestler out of Marvelous, as is one of her opponents Rin Kadokura. 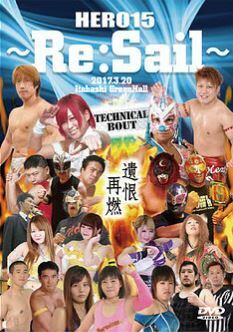 Teaming with Rin is JWP (now PURE-J) wrestler Yako Fujigasaki, so all four are pretty young/inexperienced which should make this a pretty fair fight. Momotaro and Rin start the match, they trade waistlocks and wristlocks, Momotaro gets Rin to the mat with a short armbar but Rin gets a foot on the ropes for the break. Shoulderblock by Momotaro and she tags in Mio, snapmares by Mio and she covers Rin for two. Muta Lock by Mio, she lets go after a moment and puts Rin in a stretch hold. Rin quickly spins out of it, snapmare by Rin and she puts Mio in a headscissors. Mio gets in the ropes for the break, scoop slam by Rin and she tags in Yako. Yako slams Mio as well and puts Mio in a camel clutch, Yako lets go after a moment and puts Mio in the ropes before dropkicking her in the back. Yako tags in Rin, dropkick by Rin but Mio reverses a scoop slam into a cradle for two. Back up, headscissors by Mio and she dropkicks Rin in the head, scoop slam by Mio and she covers Rin for a two count. Mio quickly goes for a cross armbreaker and gets it applied, but Rin wiggles to the ropes and forces the break. Mio picks up Rin but Rin delivers a dropkick and tags in Yako. Yako goes up top and hits a missile dropkick, Northern Lights Suplex by Yako but it gets a two count. Yako goes for the swivel body press but Mio rolls out of the way, sunset flip by Mio but Yako kicks out. Mio applies a bodyscissors and rolls Yako around the ring with it before applying a jackknife hold for another two. Mio picks up Yako, elbows by Mio but Yako hits a hip attack. Yako picks up Mio but Mio gets away, dropkick to the knee by Mio and she puts Yako in an ankle hold, but Yako gets to the ropes. Mio goes up top and hits a diving crossbody, but it gets a two count. Mio tags in Momotaro, Momotaro and Mio both dropkick Yako in the corner and Momotaro hits a shoulderblock. Yako fights back with elbows and they trade blows, Rin comes in and Momotaro is dropped with a double shoulderblock. Yako puts Momotaro in a single leg crab hold, but Mio breaks it up. Momotaro lariats Yako, she picks her up and goes for a suplex but Yako blocks it. Schoolboy by Momotaro and she also goes for a backslide, but both get two. 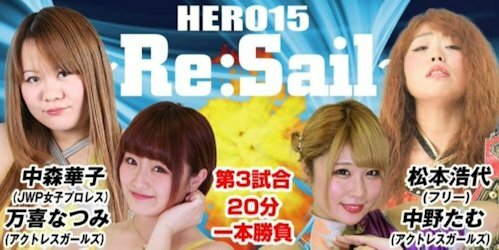 Rin returns and scoop slams Momotaro in front of the corner, Yako goes on the second turnbuckle and hits a diving body press. Yako goes all the way up top this time, swivel body press by Yako and she gets the three count! Yako Fujigasaki and Rin Kadokura are the winners. Its interesting watching this match now, 10 months after it happened, as Mio and Rin have grown so much in the meantime. This match was a pretty typical opener, pretty simple in execution but everything was done pretty tight. I hadn’t seen Momotaro before but she has the basics down pat, I don’t think she wrestles very often but her offense looked good enough even if Mio did the bulk of the work. A perfectly fine opener, nothing too exciting but well done. More random Joshi fun! At the time of this event, Tam Nakano wrestled for Actwres girl’Z, currently she wrestles for Stardom as part of the Oedo Tai faction. Her partner Hiroyo Matsumoto had one of the best years of any Joshi wrestler in 2017, she is a Freelancer that regularly wrestles for OZ Academy. On the other side, Hanako Nakamori was one of the top wrestlers for JWP, currently she wrestles in PURE-J, which is the successor of JWP when JWP closed up. Finally, Natsumi Maki is still affiliated with Actwres girl’Z but also wrestles in other promotions such as PURE-J, Ice Ribbon, and REINA. Tam and Natsumi kick things off, Hanako comes in the ring and Tam is promptly double teamed. Hiroyo comes in but doesn’t help at first as she joins in the pose, but eventually does so and Tam takes back over the match. She tags in Hiroyo, Hiroyo picks up Natsumi and hits an atomic drop. Hiroyo throws down Natsumi by the hair and gives her a neck crank, double kneedrops by Hiroyo and Tam jumps on her back to give a kneedrop a bit more weight to it. Cover by Hiroyo, but it gets two. Tam comes in as the legal wrestler and puts Natsumi in a dragon sleeper, she spins Natsumi around and hits a Stunner for a two count cover. Natsumi fights back and hits a jumping crossbody, giving her time to tag in Hanako. Hanako kicks Tam in the back before hitting a PK, leg drop by Hanako and she covers Tam for two. Hiroyo kicks Hanako from the apron and gets in the ring, but Hanako dropkicks both her opponents. Hanako goes up top and hits a missile dropkick on Tam, cover by Hanako but Tam kicks out. Tam gets away from Hanako, elbows by Tam but Hanako kicks Tam in the leg. Hanako goes off the ropes but Tam kicks her in the face, bodyblock by Tam and she gets Hanako on her shoulders, hitting a Samoan Drop for a two count. Tam tags in Hiroyo, bodyblock by Hiroyo to Hanako and she drapes Hanako across the second rope in the corner. Body Avalanche by Hiroyo, she gets on the second turnbuckle but Hanako avoids the Reverse Slash. Hiroyo and Hanako trade strikes until Hanako drops Hiroyo with a kick to the head, Shining Wizard by Hanako but Hiroyo barely kicks out. Hanako tags in Natsumi who come sin the ring with a diving crossbody, dropkicks by Natsumi and she goes for a slam, but Hiroyo blocks it. Hanging headscissors by Natsumi and she schoolboys Hiroyo, they trade flash pins but neither gets the three count. Tam runs in and kicks Natsumi in the head, backbreaker by Hiroyo and she puts Natsumi in a crab hold. Hanako breaks it up, she stays in to help Tam but Hiroyo drops them both with a double backdrop suplex. Tam gets on the second turnbuckle and hits a diving senton onto Natsumi, Hiroyo follows with a reverse double kneedrop, and she picks up the three count! Hiroyo Matsumoto and Tam Nakano win! And we have reached the main event of the night. This is one of those matches you’ll only see on smaller indie events, as its a unique pairing on both sides. Konami is the lead wrestler of GPS so naturally she gets this spot, many know her better as an active member of Stardom. She teams with respected veteran Minoru Tanaka, who has had success in many promotions over his career, including New Japan and All Japan. The other team features the leader of JWP/PURE-J, Command Bolshoi, teaming with HEAT UP wrestler and technical wizard Kazuhiro Tamura. An unusual match to be sure, but I have high hopes as all are good at what they do. Bolshoi and Konami start the match, they quickly go to the mat as Konami goes for Bolshoi’s arm, but Bolshoi gets away and ends up in the mount. Konami grabs Bolshoi’s ankle but they end up back on their feet, wristlock by Konami but Bolshoi reverses it into a hammerlock and they trade holds. They end in a stalemate and both tag out, Tamura pushes Tanaka into the ropes and he gives a clean break. Tanaka gets Tamura into the ropes but doesn’t return the favor as he kicks Tamura in the leg, they trade wristlocks but like Bolshoi and Konami they end up in a stalemate. Tamura and Tanaka trade elbows, Tanaka dropkicks Tamura in the leg and makes the tag to Konami. Konami continues on Tamura’s leg but Tamura chops her in the chest, Konami fights back but Tamura kicks her in the chest. Kick to the back by Tamura and he rakes Konami’s face with his forearm, Tamura picks up Konami and tags in Bolshoi. Bolshoi gets Konami on her shoulders and stretches her before flipping Konami to the mat, Tamura kicks Konami in the chest and Bolshoi covers her for two. Backdrop suplex by Bolshoi and she tags Tamura, as Tamura and Bolshoi take turns working over Konami. Konami fights back against Bolshoi with elbows but Bolshoi takes her to the mat and applies a short armbar, Konami wiggles to the ropes and gets there for the break. Armbreaker by Bolshoi and she tags Tamura, who comes in the ring with a diving elbow to Konami’s arm. Tamura stays on Konami’s arm, Tanaka finally comes in to break things up but Bolshoi snaps Konami’s arm over the top rope. Tamura kicks Konami but Konami slides away and kicks Tamura in the chest. Tamura kicks her back and hits a brainbuster, cover by Tamura but Konami bridges out of the pin. Tamura goes for a PK but Konami ducks it, bodyscissors roll-up by Konami but it gets two. Konami kicks Tamura in the head and finally tags in Tanaka, Tanaka dropkicks Tamura and hits a dragons screw on Bolshoi. Tanaka boots Tamura and hits a missile dropkick, he applies a cross armbreaker but Tamura gets a foot on the ropes for the break. Kicks by Tanaka but Tamura hits a Sling Blade, kick by Tamura in the corner and he hits a springboard cannonball out of the corner for a two count. Tanaka comes back with a jumping head kick before tagging in Konami, kicks by Konami and she hits an enzuigiri. Konami goes up top and delivers a missile dropkick, Tamura goes off the ropes but Konami hits a pair of head kicks. Release German by Konami, but Tamura kicks out of the cover. Kicks by Konami to the ribs but Tamura hits her with a hard lariat, he goes up top and nails the missile dropkick for two. Tamura goes off the ropes and hits the PK, but that gets a two as well. Tamura tags in Bolshoi, palm strike by Bolshoi but Konami dropkicks her. Konami catches Bolshoi’s arm and applies a cross armbreaker, she reverts it to an ankle hold but Bolshoi gets out of it. Bolshoi and Konami grapple on the mat with Bolshoi getting the better of it as she puts Konami in a short armbar. Bolshoi goes off the ropes and hits a Tiger Feint Kick, Bolshoi goes for an armbar but Konami blocks it. Triangle Choke by Bolshoi but Konami gets out of it, Bolshoi manages to re-apply the cross armbreaker but Tanaka breaks it up. Tamura comes in and kicks Konami in the stomach, Bolshoi picks up Konami and hits a Samoan Driver for two. Bolshoi picks up Konami but Tanaka runs in and kicks Bolshoi in the knee, Konami applies an ankle hold while Tanaka puts Tamura in one as well, but Bolshoi eventually gets to the ropes. Back up, high kick by Konami and she goes for Bolshoi’s leg again, but Bolshoi blocks it and puts Konami in a Fish Stretch Sleeper. Konami struggles, but has to submit! Command Bolshoi and Kazuhiro Tamura are the winners. GPS Promotions is pretty small and has a limited roster, but at least they bring in some quality ‘name’ wrestlers to help flesh out the cards. I really wish the midcard match was longer, they had so much more they could have done, but otherwise I have no complaints. If you enjoy submission “technical” matches you’ll probably really like the main event, as even though its not my preferred style they still kept it interesting from start to finish. Overall, not a major event (it took me awhile just to find the results anywhere on the internet) but for an obscure indie show the action was very solid in all three Joshi matches.